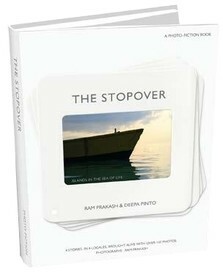 So, I was one of the few privileged persons to get a copy of The Stopover- A photo-fiction book. As the title suggests, it is a one of its kind photo-fiction book with four simple yet beautifully woven stories that has a generous dose of splendid photographs from around India- Leh to Channapatna, Ooty to Kolathur. The book is authored by Ram Prakash and co-authored by Deepa Pinto. Mr. Ram Prakash owns a flat in the complex where I stay, although he does not live here. As a special release, and on popular demand, he arranged to get a few pre-ordered copies delivered to our complex on as a Diwali bonanza and that's how I got to be one among the early birds to get to read the book. The stories are refreshing and simple yet have an underlying message at the end for the readers to ponder upon. Each story reflects upon the lives of the people from different backgrounds, with actual photos from that location to make the reading more powerful and enriching. The first story-The Tibetan Wheel Of Wisdom revolves around the lives of the Tibetans living in Leh. A story that tugs at your heart as it highlights the trauma that the Tibetan refugees have gone through and how in spite of all the hardships, they live positive lives, practicing the Zen philosophy in the actual sense. The second story-A Rocking Horse can gallop too-my personal favourite- etches out a very pragmatic and relevant story in today's times and brings out all the emotions in the right proportion without going overboard with melodrama. One gets a peek into the beautiful town of Channapatna and the lovely toys for which it is famous for. The third story-The sun shines forever-is a story woven around the Toda tribe of Ooty. While it was enlightening to read about the lesser known tribes, their culture and also to visit the less-touristy spots of the most-crowded hill-stations of the South through this story, I was a little disappointed with how the story ended. It seemed a little far-fetched and un-realistic in the end. The last story- I hear them calling- is a feel-good story that infuses the pulse of the current age youth with some strong principles thrown in to have you in good spirits after you put down the book. I quite liked the book on the whole. The USP of the book is definitely the splendid photography showcased. The visual treat is enhanced by the breezy read of all four stories. The print quality of the book is fantastic and does fine justice to the picturesque journey that the reader embarks upon. The current contest at the Write-up cafe is based on this book. You can also read a few pages of this book there to get a feel of the book. Published by Krab media, it is available for Rs. 495 on Flipkart. Have you read this book? What do you think of it? Yes, its one of its kind..and the photographs are simply awesome, Latha! Quite a different experience, right? I look forward to laying my hands on this one. I'm sure there are great pictures in there. sure, Divya..the pics are truly mesmerizing! That was a very well written review Uma. What a lovely concept! Makes it as much fun to read "grow-up" novels, as it is to read books to the kids ;). I definitely hope to check this one out. Thanks for sharing, Uma :). It is a good one, Bikram. Do read if you get a chance. Sounds like an interesting concept. And I like the sound of the stories. Hmm, everyone seems to be having a book to their name! it is, Vibha! I am with you on the last line.